To get a different mood I chose the image taken well before sunrise. In the late fall it can be quite cold in the eastern Sierras so it wasn’t the most comfortable shoot prior to sunrise. (I won’t complain since we landscape photographers go through much worse to get a great image.) I scouted the location the day before, found the trail and calculated where the sun would be the next morning. I checked possible vantage points, looking for something different from the many images I have seen. I did not anticipate the pastel nature of the light the next morning and I am delighted with the somber mood of the photograph. 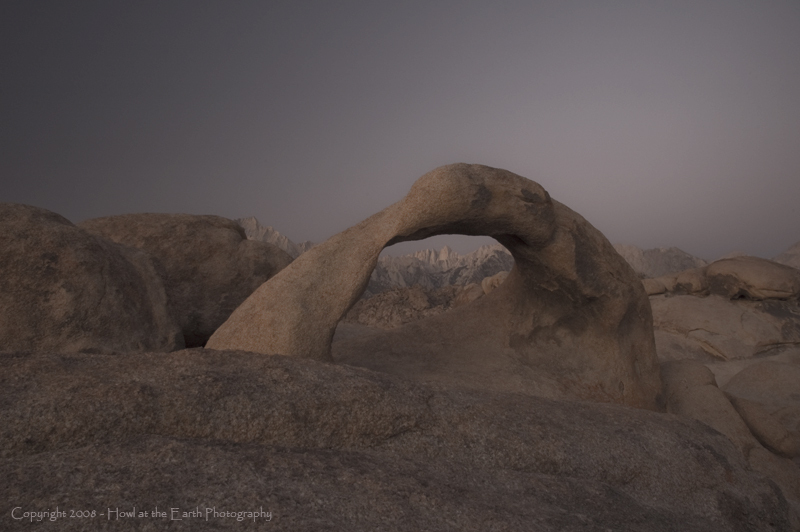 Making the arch and the smooth rock textures of the Alabama Hills the focus makes the image stand out from its peers yet still captures the spectacle of the high country in the background. Taking the time and effort to get a different perspective pays off in my photography work and in most every aspect of my life. Great results seldom come from the easy stuff.